In a medium bowl mix together the mustard, tahini, coconut aminos, sesame oils, maple syrup or agave until well combined. Slice the pressed tofu into 3 inch long 1 inch thick pieces. Place in a dish and spoon about 4 tablespoons of sauce over tofu, toss to coat all of the tofu, cover the remaining sauce and set aside. 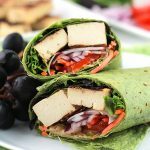 While tofu is marinating prepare your favorite veggie toppings and prepare the grill. Grill tofu for 3 to 5 minutes. Place grilled tofu in middle of tortilla and add on the toppings of your choice. Drizzle with a bit of the reserved marinade sauce, fold, slice and serve. Marinade sauce can also be used as a dipping sauce or salad dressing.